Jr Marketing Assistant Jobs. There are total 94 vacancies available in this CPCL recruitment. Interested candidates can register online applications through CPCL official Website @www.cpcl.co.in from 03 May 2017. Selection of candidates for CPCL JEA IV recruitment is based on written test. Last date to submit online applications is 31 May 2017. 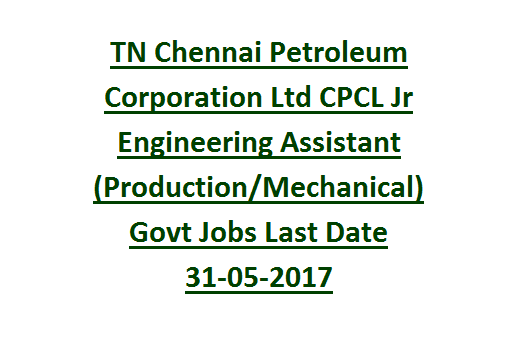 Complete details like Age limit, Qualifications, Available vacancies, Pay scale of Chennai Petroleum Corporation Ltd CPCL JEA IV recruitment exam 2017 see the information given below. Click here to see the official notification of CPCL JEA IV Recruitment 2017. CPCL Online applications Starting date: 03- 05- 2017. Last date for CPCL online registrations: 31- 05- 2017. Last date to deposit fee by challan: 31- 05- 2017. Last date to submit CPCL registration slip: 06- 06- 2017. 1. Jr. Engineering Assistant IV (Production): 22(UR- 12, OBC- 06, SC- 04) posts. 2. Jr. Quality Control Analyst IV (Quality Control): 04 (UR- 02, OBC- 01, SC- 01) posts. 3. Jr. Engineering Asst IV (Mechanical): 07 (UR- 03, OBC- 02, SC- 01, ST- 01) posts. 4. Jr. Engineering Assistant IV (Electrical): 03 (UR- 02, OBC- 01, SC- 00) posts. 5. Jr. Engineering Asst IV (Instrumentation): 02 (UR- 01, OBC- 00, SC- 01) posts. 6. Jr. Engineering Assistant IV (P & U Mechanical): 06 (UR- 03, OBC- 02, SC- 01) posts. 7. Hindi Typist: 01 (UR- 01) post. 8. Jr. Technical Assistant IV (Fire & Safety): 04(UR- 02, OBC- 01, SC- 00) posts. 9. Jr. Accountant Finance Trainee: 03 (UR- 01, OBC- 01, SC- 01) posts. 10. Jr. Marketing Assistant IV (Marketing): 01 (UR- 01, OBC- 00, SC- 00) posts. 11. Junior Office Assistant HR Trainee: 03 (UR- 01, OBC- 01, SC- 01) posts. Candidate must have completed 10th class, Diploma in relevant field (Civil/ Mechanical/ Electrical/ Instrumentation Engineering) from a recognized institution. For post wise qualification details see the official notification of CPCL. Pay scale for the current CPCL Chennai Petroleum Corporation Ltd recruitment is Rs.11, 900 to Rs. 32,000/-. In addition to the basic pay, selected candidates will be entitled for PF, Gratuity and other benefits as for Government rules. Upper age limit of the candidate is 27 years as on 31 May 2017. Age relaxation for SC/ ST candidates is 05 years, for OBC candidates is 03 years, for General PwD is 10 years, OBC PWD candidates is 13 years and for SC/ ST PwD candidates is 15 years. Selection for all posts except Fire & Safety of CPCL Recruitment will be made on merit basis in written examination followed by certificate verification. Final selection will be made on basis of Medical fitness test. Candidates will be shortlisted based on performance in written test followed by Physical Test and Endurance test. Short listed candidates will be called for verification of certificates. Chest: Normal- 81 cms, Expanded- 86.5 cms. Running: Run 1.6 Kms in 06 minutes. Load carrying: Run 100 meters with dummy load of 30 kgs with in 30 sec. Vertical Rope Climbing: Climb up to 04 meters using Hands & Feet. Final Selection will be made through medical fitness test. Application fee for general/ OBC candidates is Rs. 300/-. For SC/ ST/ PWD/ Ex serviceman candidates application fee is nil. Interested candidates for these vacancies have to apply only through online. 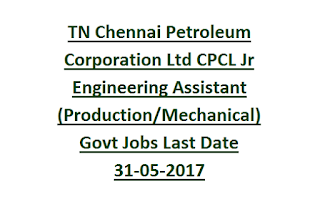 Applicants may go through Chennai Petroleum Corporation Limited CPCL official website @www.cpcl.co.in to fill the application. Online registration starts from 10.00 hrs of 03 May 2017 to Midnight of 31 May 2017. After successful submission of application form and payment of application fee, generate final registration slip using unique registration number. Last date to send registration slip through ordinary/ Speed post is 06 June 2017.